What do you call a gathering place that’s fun and relaxing for both patrons and staff alike? Is it a lodge? A lounge? A dive? A bar? A pub? A club? It’s a club. Reallly. Don’t let the name fool you. Club Mallard isn’t about dropping $20 at the door to have music blow your ears out. It isn’t about waiting a half hour for an overpriced drink that tastes like garbage, served by a too-cool-for-school bartender. Club Mallard is about making sure that you receive great service, a few laughs…and a damn, good drink. 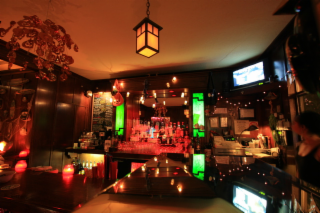 Nestled in the heart of Albany, Calif., Club Mallard is your one-stop shop for first-rate drinks, music, company and conversation. Our two-story tavern features two full bars, five pool tables, two jukeboxes, two smoking patios and lots of comfortable seating. Club Mallard offers something for everyone, whether you’re seeking some privacy with that special someone, celebrating a birthday, reconnecting with old friends or looking to make new ones, Whatever the occasion, our good-time atmosphere makes Club Mallard one of the premier hangouts in the East Bay.